Lineage. Designated 125th Observation Squadron, and allotted to the NG, on 30 Jul 1940. Activated on 10 Feb 1941. Ordered into active service on 15 Sep 1941. Redesignated: 125th Observation Squadron (Light) on 13 Jan 1942; 125th Observation Squadron on 4 Jul 1942; 125th Liaison Squadron on 2 Apr 1943. Inactivated on 15 Dec 1945. Redesignated 125th Fighter Squadron, and allotted to the OK ANG, on 24 May 1946. Extended federal recognition on 15 Feb 1947. 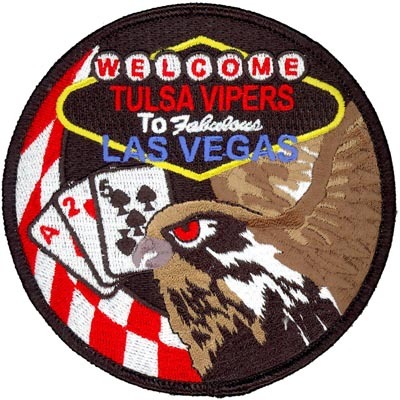 Redesignated: 125th Fighter Squadron (Jet) in Jun 1950; 125th Fighter Bomber Squadron in Nov 1950; 125th Fighter-Interceptor Squadron on 1 Aug 1957; 125th Air Transport Squadron on 15 Jan 1960; 125th Tactical Fighter Squadron on 25 Jan 1973; 125th Fighter Squadron on 15 Mar 1992-. Assignments. Oklahoma NG, 10 Feb 1941; 68th Observation Group, 15 Sep 1941; 77th Observation (later Reconnaissance) Group, 12 Mar 1942; II Air Support Command (later II Tactical Air Division), 11 Aug 1943; III (later I) Tactical Air Division, c. 11 Oct 1943 (attached to 76th Tactical Reconnaissance Group to Jan 1944); US Strategic Air Forces in Europe, 4 Jun 1944; Ninth Air Force, 7 Jun 1944 (attached principally to Headquarters Command, European Theater of Operations, 7 Jun-17Jul 1944, and Ninth Army, 17 Jul-15 Nov 1944, and to XXIX Tactical Air Command [Prov] beginning 15 Nov 1944); IX Fighter Command, 1 Dec 1944 (attached to XXIX Tactical Air Command [Prov] and further attached to Twelfth Army Group, 15 Nov 1944-8 Jun 1945, and principally to Sixth Army Group, 8 Jun-25 Jul 1945); XII Tactical Air Command, 20 Jun-15 Dec 1945 (attached to Headquarters Command, US Forces, European Theater, 25 Jul-15 Dec 1945). 137th Fighter Bomber Group, Nov 1950-10 Jul 1952; 138th Fighter-Interceptor Group, 1 Aug 1957; 138th Air Transport Group, 15 Jan 1960; 138th Tactical Fighter Group, 25 Jan 1973; 138th Fighter Group, 15 Mar 1992; 138th Fighter Wing, 1995-. Aircraft. In addition to O-38, 1941-1942, and O-47, O-49, O-52 and O-59, 1941-c. 1943, included YO-50, O-57, and O-58 during period 1941-1943; primarily L-5, 1943-1945. P-51D, 1947-1950; F-84B, 1950-1954; F-80C, 1954-1957; F-86L, 1957-1960; C-97G, 1959-1968; C-124C, 1968-1973; F-100D/F, 1973-1978; A-7D/K, 1978-1993; F-16C, 1993-. Operations. Combat in ETO, c. Aug 1944-May 1945. Called to active duty as part of the Korean War call-up. Air defense of Midwestern US. Transportation of cargo to Vietnam and throughout the world, 1960-1973. Deployed to Southwest Asia 10 times and participated in Operation Provide Comfort, Operation Northern Watch, and Operation Iraqi Freedom. Campaigns. Northern France; Rhineland; Ardennes-Alsace; Central Europe. Decorations. Cited in the Order of the Day, Belgian Army:  Oct-17 Dec 1944; 18 Dec 1944-15 Jan 1945. Belgian Fourragere. Emblem. Approved 15 Sep 1943.